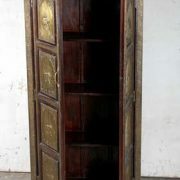 Cabinet made to fit an antique sunburst door with decorative salvaged carving. 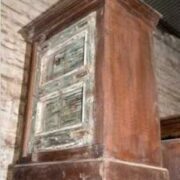 Made by creating a cabinet body to fit around a salvaged antique door, this cabinet is a really interesting, unique piece. The door itself, an antique hand carved door with a striking sunburst design is extremely eye-catching in itself. 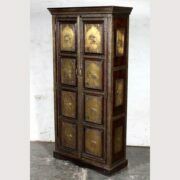 To add even more character to the piece, the door has been framed by intricate reclaimed hand carvings that make a delightful floral border to the front of the unit. Even the base of this piece has been shaped decoratively to add a further touch of magic. The door and the framing carving a touch of worn paintwork but the cabinet mostly has a natural wood finish with a very subtle whitewash in places. Inside the cupboard has one internal shelf, creating two spaces for storage.